Blackmagic Forum • View topic - @BMD: DaVinci Keyboard for $1000 - Why? I do not understand the high price on that new DaVinci Keyboard and I hope you can explain me (or us) why this particular hardware is as expansive as a Pocket 4K. I think the keyboard is overprized for a couple of more buttons. If the keyboard and the micro panel were combined, I could understand that price point. But this is only a keyboard. Re: @BMD: DaVinci Keyboard for $1000 - Why? This is the price for free Resolve. Andrew Kolakowski wrote: This is the price for free Resolve. I already own the Studio version. I do not need any "hidden" licenses. It's produced in small quantities. When you make money with Resolve and you can work a lot faster than it is money well spend, when you Resolve for hobby it's just cost. MishaEngel wrote: It's produced in small quantities. Well... you also could buy a ShuttlePRO v2 and assign those additional buttons by your own for a fraction of the keyboard price. Full aluminium housing, high quality rotary jog wheel that is presumable optical. otherwise it would not draw so much power as said in the video.. But indeed $1000 for a keyboard were every chinese company can push a keyboard for $2 dollars.. Difference is hardware, design, look, materials, i guess even the key's used.. Don't expect a foil keypad behind those buttons. But real tacticle buttons. No one is stopping you going that path. Well, I do, others as well. But my questions still has not been answered yet. What makes this aluminium housing with a few buttons so expansive? Xtreemtec wrote: Full aluminium housing, high quality rotary jog wheel that is presumable optical. otherwise it would not draw so much power as said in the video..
Are you saying optical encoder is needs a lot of power? JeffreyWalther wrote: Well, I do, others as well. As has already been mentioned, its that expensive for several reason. It's going to be produced in much smaller quantities than your typical keyboard. Thus the design, engineering, and tooling costs are going to be much higher per unit. it has an aluminum top plate, and form the shape, it looks like it has to be machined out a solid chunk of aluminum (not cheap as you have a lot of waste), compared to some other aluminum keyboards that are formed out of aluminum sheet. Last edited by Dan Sherman on Tue Apr 09, 2019 8:58 pm, edited 1 time in total. Probably anything with a limited run is going to come with a premium price -- and as explained by G. Petty, the aim consumer demographic for this product is in the bulk-production sector. The extremely-short turnaround, high output producer where every click costs money, the way grade suites went for $5 a minute (average) up to 5 or 6 times that for premium service. Right Marc, Walter? Also, steel and aluminium tariffs. That keyboard is bad ###, but way too expensive. I get it's meant for people who are editing every day, but still $1000 is a bit overpriced for something that's optional, but not necessary. Maybe at $500 I'd consider getting it. But $1000 for a keyboard just is too high of a price for me to swallow. Again, maybe for those editing everyday as their job in a studio. Sadly not for anyone outside that. Because I’d love to own it. But it’s not necessary enough. I can use what I already own. Last edited by Chris Chiasson on Wed Apr 10, 2019 5:19 am, edited 2 times in total. JPOwens wrote: The extremely-short turnaround, high output producer where every click costs money, the way grade suites went for $5 a minute (average) up to 5 or 6 times that for premium service. Right Marc, Walter? You nailed it. If you think this keyboard is too expensive then you're obviously not part of the target market. From a business perspective... it's not what it costs that matters but what it's worth. If this keyboard saved you (say) just one hour per week... how long would it take to pay for itself? In the case of a busy studio I'd say not long, not long at all. ...And that costly keyboard lacks backlit keys -- (and with user-variable brightness adjustment)? Wow. That proposition is not Grant Petty'esque at all, IMHO. Yeppers. My thought exactly -- and buy a handsome, sturdily built gamer's keyboard like Corsair K70 Mkii or similar, with mechanical action, backlit keys, with Macro buttons (which might well even be mappable to DR functions). It's like the iPhone X. It looks cool, Everyone wants to have it, but it is pricey as hell. You can still go for the Samsung galaxy 4 or iPhone 4 which cost significant less.. But hey it does not have the features you want, it does not have the looks you want..
That's a valid point. I kept track of all our hours last year, and when we got the Advanced Panel in April, I made notes on how my hours were for one of our main clients. By my calculations, I realized that we saved anywhere from 10%-15% on every project simply because I had direct buttons to get to certain features. In a typical 10-hour day, that's about 90 minutes, so we wound up almost being able to get 6 days of work out of 5 days. Adding up the time, the panel paid for itself in 6 months. To me, it's all a question of giving people choices on how they want to work. More options are better. If you can't justify the expense, don't buy it. Nobody's forcing you to buy it. For a busy post house, particularly ones with dozens of rooms and multiple editors working around the clock, it would make sense. For one guy cutting an occasional YouTube or wedding video, it might not make sense. Why? WHY? Why the Hell not. Hell I am getting one. That thing is a dream. Nice to see the marketing department hasn't missed a beat. Offer it in mahogany, carbon fibre, or walnut and the 1000 bucks is a no brainer. Howard Roll wrote: The Fastest Editing Physically Possible! Keep it all metal. Although carbon fibre would be cool. Last edited by Clayton Von Isaacs on Fri Apr 12, 2019 12:25 am, edited 1 time in total. RCModelReviews wrote: From a business perspective... it's not what it costs that matters but what it's worth. There is a Wilde-ism that goes something like: "A fool knows the price of everything and the value of nothing." I'm also not kidding about the steel and aluminium tariffs. Adds 25% to the purchase price. So, people who are noodling the idea of $500 - $750 aren't far off the punitive value that the current American administration is inflicting on trade. Interesting that Marc illustrates a Sony keyboard (which I sold a few of) -- while I worked a short stint for that company, as Sales Reps and Managers came to appreciate, the prefix "BK" really stood for *profit center" because those items had margin. You could either pad out a sweet deal for the company or present a sweeter one to the buyer, just massage the quote. Has anyone actually tried the shuttle pro 2? Does Davinci let you assign the same things the keyboard will. Or is it locked like the tangent desks. Ooooh, if you have a Quasar Great Time Machine, I'll take it for $20 + shipping (working or not)! Very nostalgic. JPOwens wrote: Interesting that Marc illustrates a Sony keyboard (which I sold a few of) -- while I worked a short stint for that company, as Sales Reps and Managers came to appreciate, the prefix "BK" really stood for *profit center" because those items had margin. You could either pad out a sweet deal for the company or present a sweeter one to the buyer, just massage the quote. Hey, am I far off from the $2500 price on the Sony BKE Keyboard? A friend of mine who did own a very similar GVG keyboard was positive that was the price, but we don't have the old pricelists to know for certain. That picture is from it's eBay page. Someone has one up for sale on there. 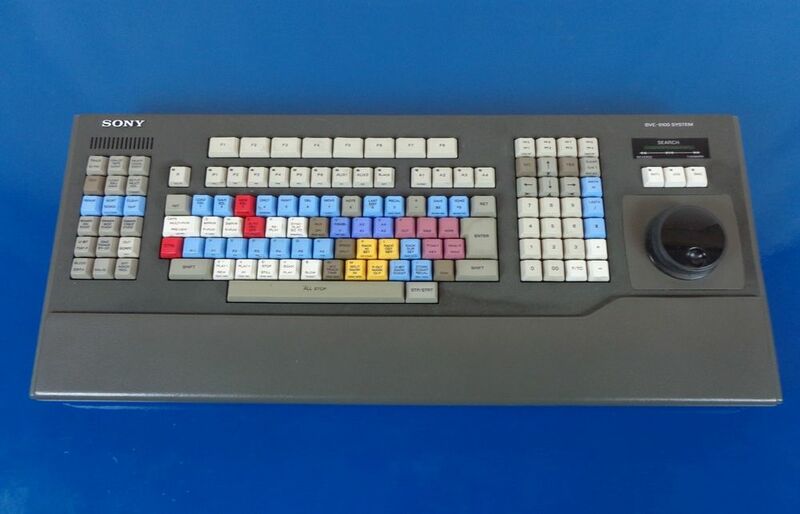 The keyboards used with old linear editing controllers were mostly supplied as a standard part of the system. CMX, Ampex, Sony, Grass Valley etc, made keyboards with dedicated buttons and controls, which made regular keyboards almost unusable on these systems. It was extremely rare to buy one of these keyboards as a stand alone unit, which is why they were very expensive. Editing systems back then were low volume, high margin sales due to limited demand and high development costs. Those shuttle/jog wheels on the keyboard are not a simple device and will add a considerable cost. IMO a jog wheel on the right is less useful on mouse driven software than a left hand controller like the Contour Shuttle or Lightworks controller. People clearly don't understand the price of high quality made, ment to last, component replaceable products. Woah! One of those rare moments this writer has observed M.W. 's embrace of respect for varied preferences among different types of DR users, re: controller hardware choices! Now, off to placing an order at https://posttools.tachyon-consulting.co ... 16fd43adaa for cost-effective, comprehensive speedy access, visual feedback and control of Resolve 16 functions at the behest of @Glenn Venghaus -- that awesome DaVinci Resolve forum contributor. Last edited by Peter Benson on Wed Apr 17, 2019 3:22 am, edited 3 times in total. I think the thing people are struggling with is it looks like a keyboard...where as in fact it is an edit controller, which enables and allows significant increase in speed and usability over a traditional keyboard and mouse etc. That may be worth something to you...or it may not. When I started with a Tangent wave for grading, it didn't allow any more functions then my keyboard and mouse already gave me ... but it gave me dedicated, quick and precise access to those functions, ease of use, and a much faster turn around of work. That was worth the expense of the Tangent. Paid for itself in no time. If I could save an hour a week on the edit page with the BMD "keyboard" then the US$1000 would be recovered fairly soon. Peter Benson wrote: Now, off to placing an order at https://posttools.tachyon-consulting.co ... 16fd43adaa for cost-effective, comprehensive speedy access, visual feedback and control of Resolve 16 functions at the behest of @Glenn Venghaus -- that awesome DaVinci Resolve forum contributor and disruptor of a programming genius. Other then that, my controller is focused on doing stuff that can NOT be easily or at all done with a typical keyboard shortcuts like most editing functions as would be a waste of my time and design efford and anyone with a button box or keyboard can do that themselves. Also true it is focused and originated on the color page as that is typicaly where you need a controller as non of these things can be keyboard driven. But i do support the edit page where it counts. One of the smoothest source/timeline window JOGs around (no crappy keyboard presses, but proper smooth jog) And after looking at the BMD keyboard and a user tip, just extended it to the CUT page and switchable between the super fast mini timeline scroll and the viewer scroll. (will drop a video showing this coming weekend likely). CUT page is new for me as well , so will see what else usefull i can put in there before final release. Then (so far) unique to my controllers, automapped control of edit page (and FL page) inspector tab content, incl OFX, audio plugins, edit sizing, cropping etc. So its still and will remain primary color focused but over the years has become a little handy edit/fairlight page companion. If you are a pure professional editor , go for the new BM keyboard i would say, a great and focused piece of high quality kit. Last edited by Glenn Venghaus on Wed Apr 17, 2019 10:41 am, edited 2 times in total. Why *not*? Sounds like you've not sufficiently investigated that APC40 controller solution, advancing such a warning. Your good intention is very much appreciated though. Suppose Color Page, Edit Page, Cut Page and other functions like audio sweetening, mixing, mastering and even animation -- all on a pending OSX Mojave iMac setup is in the planning stages here, for an exciting, new workflow paradigm with various awesome controllers without the curse of Micro$haft (sic)? Redmond is unrelentingly upsetting hordes of Windblows (sic) end-users with their forced-update machinations culminating in the "shock and awwwwww" (sic) of system shutdown and OS installation damage scenarios all over the world. 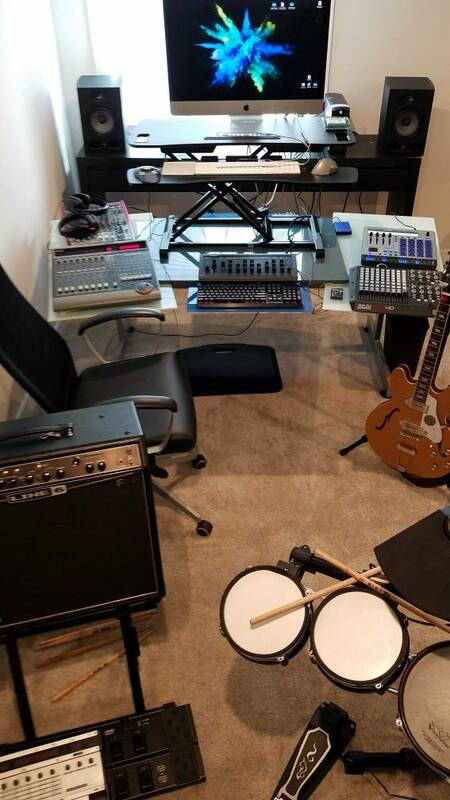 So OSX (and experimentally, a Linux flavor that supports external MIDI and USB-connected controllers nicely), will also get my vote as a new host for Resolve here. Last edited by Peter Benson on Wed Apr 17, 2019 10:31 am, edited 2 times in total. Why *not*? Sounds like you've not sufficiently informed on that solution, to advance such a warning, though your good intention is very much appreciated. excuse me for trying to be helpful ... your signature says windows, not mac, and from the page you linked to it shows and talks about grading - little about editing, and even Glenn himself says it is more color page focused. No worries. As stated, an iMac system is in the process of being set up (*this very day, in fact) for Resolve 16 Beta experimental use though my host PC with Resolve Studio has been abandoned due to a Microsoft forced-update attempt having destroyed a brand-new G-Technology USB-C external drive during a Deliver Page rendering session -- although my ASUS Windows 8.1 machine was not even connected to ethernet nor WiFi. Micro$haft is insanely ruining many users' hardware and Windows installations. As you know, Resolve was very much Color Page focused as was also the case with Glenn's Contoller hardware/software solution via Tachyon Consulting -- but that's the past as it's evolved from mere Color Page functionality substantially. So, though not applicable, thanks for your expressed desire to alert me. As promised in earlier post , a small video of the super smooth VIEWER/MINI TL JOG in CUT page as currently implemented . Handy for the occasional editor that is not in the market for BM's excellent new edit keyboard. Example is for the Beatstep version but similar in all controller kits. For the moment, I just do not see the benfit over a generic keyboard and some 3rd party wheel controller. Maybe BMD could create some demonstration video to convince people like me. If that keyboard is so focused on DaVinci, there should be a video with a proof of concept, showing what is possible. In other words: i need a reason to buy this hardware, but it seems that I could accomplish the same with 3rd hardware. For the moment what i saw from that contoller is that it allows direct clip and cut manipulation as well as extensive trimming all with the jog wheel in the CUT page. Not just jog and scroll. Basicaly your hands never leave the controller while cutting/assembling. That is so far not possible with any 3rd party controller (yet) and a huge difference and selling point if you are a full on editor. That and the overall build quality , i would easily buy one if i was an editor. For occasional work there are other options. It all depends. Glenn Venghaus wrote: For the moment what i saw from that contoller is that it allows direct clip and cut manipulation as well as extensive trimming all with the jog wheel in the CUT page. Not just jog and scroll. Then I could see the benefit for my own work and then invest those $1k. I really need to know, if I can get faster with this particular hardware or if I get slower*. But for now, ....no demo, no reason, no purchase. So please BMD, give me some demos and reasons to buy it. I already use Studio and it would be great if I could improve and speed up my workflow. * in the old days of Premiere, I was used to have a jog shuttle with buttons, but after the switch to Resolve, I found this hardware unnecessary next to my keyboard and mouse. In this video, Grant demonstrates how the DaVinci Resolve Editor Keyboard interacts with the Cut page. He starts talking about the keyboard at 1:49:30. I see and understand the benefits of the new Cut Page (thanks to this guy here). I also can see the benefit of the keyboard in that case. But I am still not convinced by the entire concept for my work. I do a lot of music video edits, i.e. I have a master clip and a lot of alternative shots that have to be manually aligned and synced over the tracks. The shots are made one after another, so TimeCode alignment is not possible. can I then go on by inserting cut points and removing portions of the 2nd clip, where I want to shine through the master clip? Can I insert and sync a 3rd clip the same way and switch back and forth between all tracks to remove/delete portions of the clip with leaving the gap? Is this possible with the Cut Page and the keyboard? JeffreyWalther wrote: For the moment, I just do not see the benfit over a generic keyboard and some 3rd party wheel controller. Until you actually try it, you'll never know. I'm not an editor, but I can say if I was, another $995 wouldn't bother me in the least. Hell, even if it only saved me 15 minutes a day, it'd still pay for itself in a few months. You always have the freedom to work any way you want to. Hell, you could work with any keyboard and mouse as long as they were USB-compatible. Do what makes you happy. I don't believe the keyboard is shipping until August, so we'll see what changes between now and then. My setup includes the eucon transport which has a very nice wheel on it. If you do a lot of editing, and don't use a wheel, you are missing out. Can't remember what I paid for it, but it was well worth it, even 7 or so years later...main difference is I can use it with Avid or Resolve. Due to desktop real estate, I would only buy Resolve keyboard if it worked with Avid as well. The chance to combine my keyboard and transport would be too much to pass up, but I still do my cutting in Avid. 1000 dollars is a drop in the bucket for that kind of functionality. So, neither the Cut Page nor the keyboard seem to be useful for my work. berzerker wrote: Has anyone actually tried the shuttle pro 2? Does Davinci let you assign the same things the keyboard will. Or is it locked like the tangent desks. I work at a hospital and support our dictation and transcription systems. I remember when I first met the transcriptionists, some of whom were using $400 Kinesis keyboards which are crazily...ergonomic, split bowls of keys left and right, every key at your fingertips without lifting your hands. At first I thought, who needs a $400 keyboard? Then I came to realize that someone who types 90 wpm for 8-10 hours a day because every single word typed is money in their pocket. People who have to reach a certain line count to get their bonus need one. Every time they touch the damn mouse they're losing money. So yeah, $1000 in the grand scheme of things is no biggie to those who need to shave off time to make money.